“Before ‘youth’, if nothing was impossible, shades would be cleared, and one would surmount everything and become a sun that shines upon everything,” Japanese poet Yosano Akiko once said. The photograph above, taken in July 2011, ushers me into reminiscence of moments of my late teens when two of my college and high school confidants and I founded a band called ‘Be Young’ – a near pun and parody of the local band ‘Beyond’, famous in the 1980s. Now the name to me means much more. It reminds me how rebellious I was with my hair dyed like a triad member, my pretentious black-framed glasses without lenses, and despite the unshakable truth that men grow physically old with time, memory remains forever young. Youth stays with our friendships, ignorance and passion. 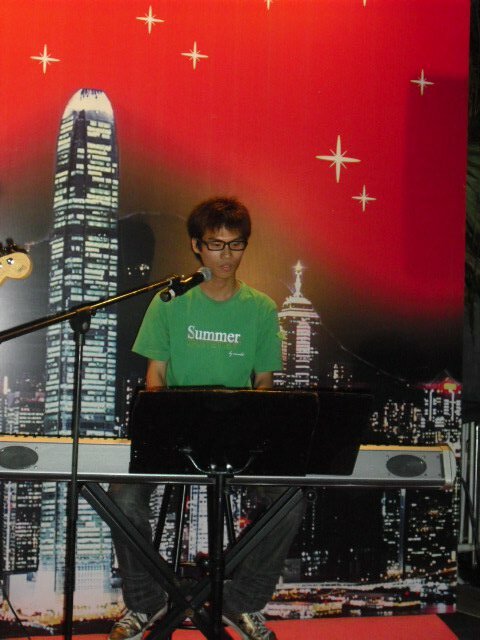 An unprecedented performance at the Avenue of Stars sent shivers down my spine, for I feared that one note might slip and skip because of my sweaty trembling fingers. But, courage had to be mustered because we all knew none of us wanted our previous repetitive practices to come to futility. Tone-deaf, we sang with passion to open up our “Boundless Seas, Vast Skies”. Nothing could be more joyful than to share the same goal and work towards it in the same time and place; nothing could be warmer than to end up with ceaseless applause. Though a hot and summer day, our summer stays in my mind like the sun that always shines.